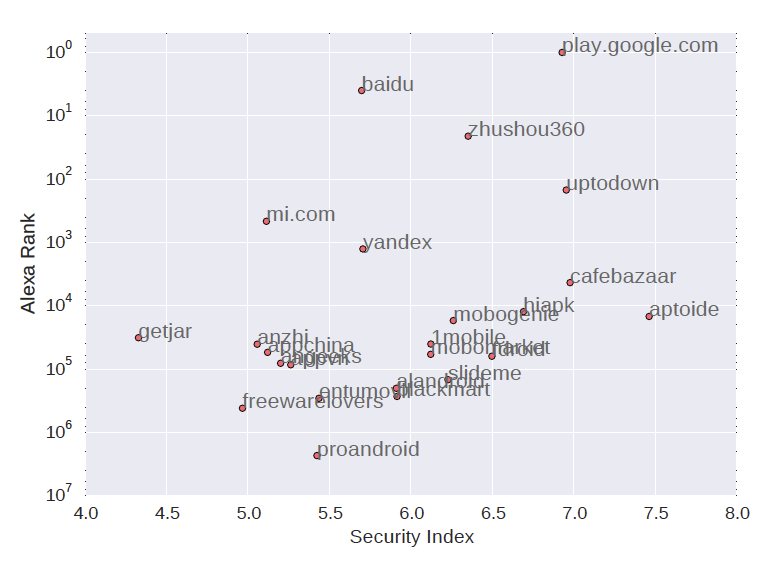 A recently published paper by the Waseda University and the NTT Secure Platform Laboratories analysed 27 Android marketplaces evaluating security according to several parameters where the most important is the presence of malware. In the paper titled “Understanding the security management of global third-party Android marketplaces” the authors collected more than 4.7 million apps from 27 marketplaces and analysed recovered apps for the presence of malware behaviour. Ishii et al propose a security index which take into account the following six parameters for determining a marketplace’s quality. We can notice Aptoide ranked the most secure marketplace though having lower popularity in the Alexa Ranking than other less secure markets. I am currently Aptoide’s Security Team Leader and I am happy to see such good results recognised by the scientific community. I hope that results will translate into higher adoption of such a great market by ensuring trust and confidence regarding Aptoide marketplace security to new and existing users.